On a recent trip to Los Angeles, a friend recommended a great brunch spot called Huckleberry. While pretty much everything on the menu was tempting, I settled on the Quinoa, farmer’s market butternut squash, Rutiz kale with two sunny side up eggs. Detoxing after a gluttonous week in California, and yearning for this delicious meal at home, I set out today to recreate it. Pleased to report I had great success (if I do say so myself). And since most of us can’t get to Huckleberry very quickly, I figured I’d share the wealth with you! A perfect winter meal. 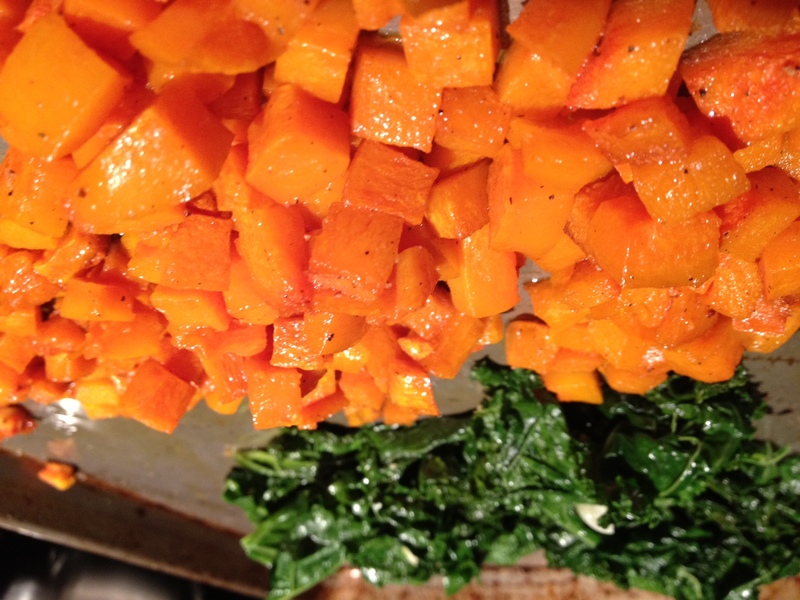 Preheat oven to 425 degrees F. Toss butternut squash with a generous amount of olive oil, salt and pepper and bake on a sheet tray for approximately 20-25 minutes until squash is tender and starting to brown. Set aside. Heat a little olive oil in a medium Dutch oven or pot, add 1 teaspoon of minced garlic and sweat for 1 minute without coloring. Add Kale and a little water and sauté covered, stirring occassionally, until kale is tender, about 5-7 minutes. 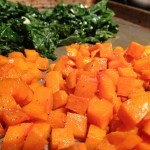 Remove Kale and set aside. In same pot, heat about 2-3 tablespoons more olive oil over medium heat, add shallot and sweat about 1 minute. Add remaining garlic and sweat 1 minute more. Add quinoa and sauté until all the grains are coated in oil, about 1-2 minutes. Add chicken stock and rosemary and bring to a boil. Check liquid and adjust seasoning as necessary (see note). Reduce heat to low, cover and simmer for 15 minutes. Remove from heat, and keep covered 5 more minutes. 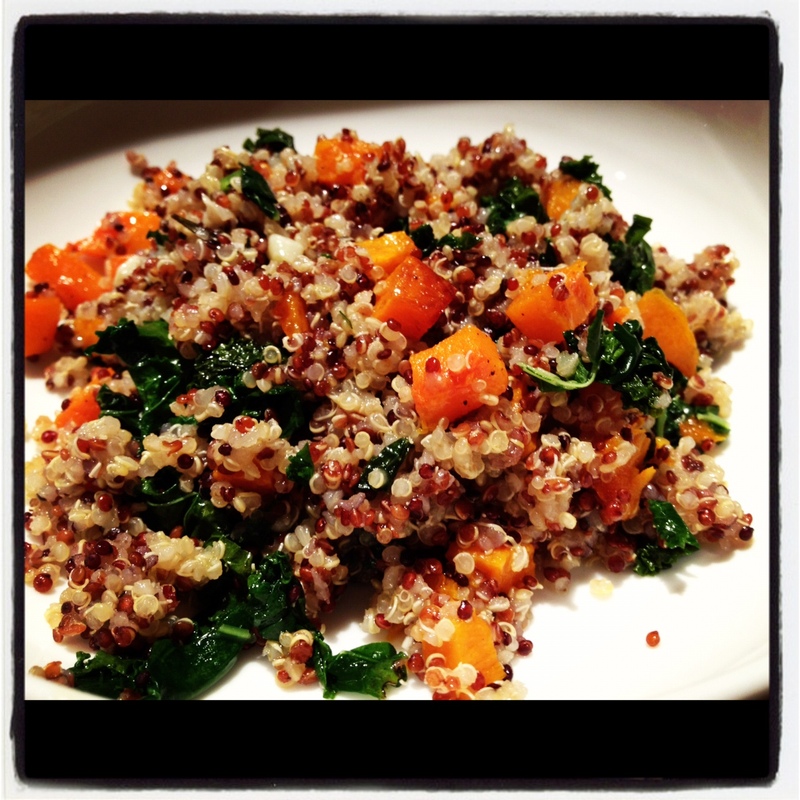 Fluff quinoa with a fork and add butternut squash and kale back to pot. Mix until well combined and serve immediately. Topped with 2 sunny side up eggs, this makes a wonderful main dish… either brunch or dinner. Or serve it as a side dish, with some freshly grated Parmigiano Reggiano cheese. Note: You want the liquid to be nicely salted, this is what is going to give your quinoa flavor as it cooks and absorbs the liquid. You never want to season quinoa, or any grain or pasta for that matter, after it has finished cooking otherwise you don’t penetrate the skin. This entry was posted on Sunday, January 6th, 2013 at 6:30 pmand is filed under Recipease. You can follow any responses to this entry through the RSS 2.0 feed. You can leave a response, or trackback from your own site.